A cottage garden classic with sky blue flowers tipping at the ends of wiry stems. A carefree addition to a flowery meadow, equally at home in a container, where it can show off its sea of bloom all summer. 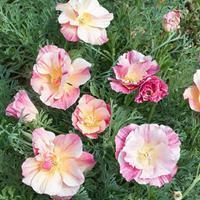 Regular, well-drained soils suits it fine and it blooms quickly from a direct sow in spring. Depth: Surface sow and press in lightly. Nice as a self-sowing border or bedding plant,lovely along the garden's edge or in containers. Watering Details: While somewhat drought tolerant, this plant does best with about 1" of water per week, especially during dry spells. Do not over water. Fertilizer: Scratch in a few inches of compost prior to planting. If soil is poor, supplement with a bloom-boosting organic granular or liquid feed once per month. Flowering: Delicate periwinkle-blue petals dance gracefully over the fine stems and foliage. Seeds: Flowers turn into fruits containing the seed. The genus name Viscaria means sticky, in reference to the stems, which can have a tacky texture. The specific epithet oculata means "eyed" and may be in reference to the flowers.